Using the very finest ingredients, including homemade sauerkraut, which used up two cabbages included in the final winter box of veggies in a CSA farm share from Roxbury Farm in Kinderhook (Columbia County), New York, to smother all beef hot dogs was a surprising meal for this mostly vegetarian, mindful eater. 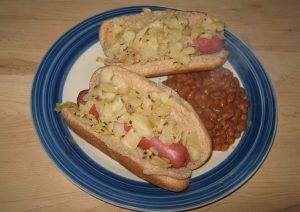 But as I awaited the two week magic of fermenting the cabbages into sauerkraut, a certain craving rooted in childhood took over (even though it’s been decades avoiding the consumption of hot dogs even at the ballpark). This dietary surprise was the result of finally trying out the easy-to-make recipe for sauerkraut included in Tara Whitsitt’s highly-recommended Fermentation on Wheels which we praised in a book review over a year ago. Now with St. Patrick’s Day a few days away and many households cooking up corned beef and cabbage, why not turn an extra head of cabbage or two (on sale at many markets and co-ops) into sauerkraut? 1. Cut cabbage into quarters and finely chop. Place chopped cabbage into a large bowl. If you have outer leaves of cabbage, rather than compost them, place them aside. 2. Add caraway seeds and juniper berries to the bowl of chopped cabbage. 3. Add 2 tbsp of salt and massage the cabbage for 5-10 minutes. Your cabbage will release water, which will serve as the kraut’s brine. Taste the cabbage—you may want to add more salt to your liking. 4. Check for a puddle at the bottom of your bowl and squeeze a handful of cabbage above the bowl to check whether it has produced enough brine. Once gently squeezed, brine should drip with ease from the cabbage. 5. Pack the cabbage into your gallon jar until it’s submerged below brine. Take the cabbage leaves you set aside from earlier and layer them on top of your kraut, pressing down. 6. Add weight, such as scrubbed and boiled river rocks or a small jar filled with water, on top of the layer of cabbage leaves. Secure a tea towel to the mouth of your jar with a rubber band to keep dust and bugs out. 7. Wait a week and taste—you may want to keep it going another week, but it’s good practice to try your ferments along their journey. 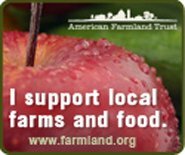 Vegetables will ferment at different speeds depending on their environment—the warmer it is, the faster it will ferment, while the colder it is, the slower it will ferment. Most vegetable ferments thrive between 68ºF to 76ºF. 8. When the sauerkraut is to your liking, cover it with a lid and store in the fridge. Keeping your new kraut cool slows fermentation, so you can more or less enjoy the fermented flavor from when you sealed the jar. 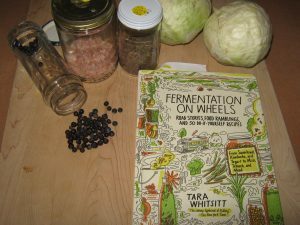 Since in the winter, the temperature in my home in wintry Albany, NY is kept well below the 68ºF to 76ºF range of temperature noted in Tara Whitsitt’s recipe as ideal for fermentation, it took two weeks until the cabbages in my farm share reached the stage of tanginess where I decided it was time to cover the jar with a lid and store in the fridge. 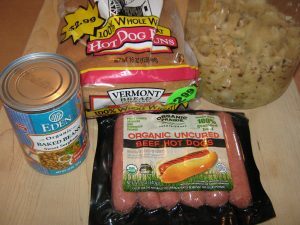 Despite using the very finest ingredients available at the Honest Weight Food Co-op in my hometown of Albany, New York, I calculate that the per hot dog cost came to $1.75. How’s that for beating the cost of cheap fast food?